Patricia is 33, happily married as far as marriages go, one kid, steadily employed in the usual American less­than­satisfying corporate job, good eating habits, and, until recently, a health club goer a couple/three times a week. Now she’s too tired for that. Just looking at her, you can tell she’s dragging. Circles under her eyes and she needs to blink a couple of times to bring a thought to the surface. The adrenal cortex, indirectly connected to your brain through the pituitary–the master gland that also controls your thyroid and ovaries (or testicles, depending)–is the slower, second responder. The cortex deals with chronic stress, and its several hormones regulate metabolism (especially glucose for energy), reduce inflammation, and control blood pressure by balancing sodium. Adrenal fatigue is not a difficult diagnosis if your doctor has it on her mental “check­for­this” list. The challenge patients face is that most conventionally trained endocrinologists don’t believe adrenal fatigue is real. My guess is they can’t tolerate a diagnosis that emerged from natural medicine practitioners. The best book on the subject, Adrenal Fatigue: The 21st Century Stress Syndrome, was written by a (heaven forfend!) chiropractor, James L. Wilson, DC. The anti­alternative website quackwatch.com lists adrenal fatigue among its unproven “fad diagnoses,” joining candida overgrowth, Gulf War Syndrome, and multiple chemical sensitivity. The even more unsympathetic Endocrine Society (I inadvertently typed “Endocrime”) dismisses adrenal fatigue as a myth. However, unless your doctor thinks of ordering the simple test that measures cortisol levels in your saliva (which reflect the function of your adrenal glands) you could go undiagnosed for years. The best functional medicine test to evaluate your adrenal function is a take-home kit containing four empty plastic vials. You collect saliva at 8 am, 12 pm, 4 pm, and 8 pm and FedEx (envelope in kit) your specimens to the lab. Some insurers now cover at least part of this test, so expect an out-of-pocket of around $100. 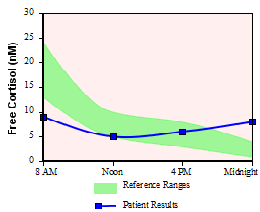 Patricia’s adrenal stress profile was pretty much a flat line. Classic adrenal fatigue. If you think you could have adrenal fatigue, schedule with one of our functional medicine specialists: Dr. Alaina Gemelas, Dr. Caley Scott, or our newest WholeHealth Chicago physician Neeti Sharma, MD. Next week, I’ll outline our approach to help worn out Patricia get her life back. Can you also do a follow-up article about over-active adrenal glands? Dr. Kelley diagnosed me with that, and I’m still working on treating them. Thanks!